Igo Eco Arts: Barefoot Books Classic Poems Giveaway! 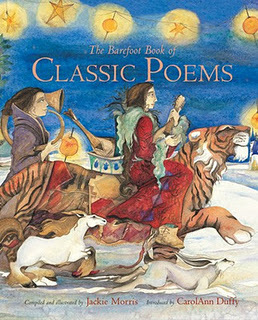 Barefoot Books Classic Poems Giveaway! As Christmas draws closer, I would like to celebrate with my first giveaway! our Saturday afternoon artists to paint with watercolour. It only takes a moment to subscribe. Only one winner will be selected on November 27, 2011 and announced during the next week here. My favorite illustrated kids book? So tough. My little one currently loves Bear Snores On. We have an illustrated version of Frost's Stopping In Woods on a Snowy Evening that I like. I love Gorilla by Anthony Brown. Not only is the story really touching but the illustrations have lots of hidden elements that children love to spot. You also can't beat Beatrix Potter for great classic illustrations! Happy Advent! The winner of the giveaway has been chosen by my four year old. We did a random pointing selection process to keep things fair. Congratulations @aimeesmum a copy of The Barefoot Book of Classic Poems will be winging its way to you. I love how illustrations in stories sometimes tell other aspects or offer humour that can be missed easily.